Oh hai! I’m back! It’s been a long couple of months there. All work and no play make Blair a dull girl. Re: ASIA! I love Hong Kong. It was my second time there, and it is China, one of my favorite countries. A little different than other places in China, true, but still, it felt like home. I could live there, but the trick would be finding a place for a recording studio for my husband. Real estate is a little pricey in the city! We then traveled all across Korea, and I got to see a lot of the country that I hadn’t seen before. It was a great place, and Seoul is just huge and bustling and interesting! I think there is a rhythm to every city and country, and you finally are at home when you feel it. Seoul isn’t quite like that for me yet, but I hope it will be. So, I started out pretty well, living off of my Larabars and avoiding gluten. The conference even had gluten-free choices on the lunch buffet. And the Halal food was really good. But, after a long day when the executive lounge has free alcohol and hors d’oeuvres, a chicken tender or dessert might just make their way onto my tiny little appetizer plate. And then the next day there would be some fabulous dim sum or noodle dish. Anyway, I didn’t beat myself up too badly over that. It’s a trip overseas, and I wanted to enjoy every minute of it. Korea photos are in this set, and Hong Kong photos are in this set. And, Korean food is fairly primal! This dinner was really really good. We met up with a friend who lives in Seoul, and he ordered all the good stuff for us. His Korean is amazing. 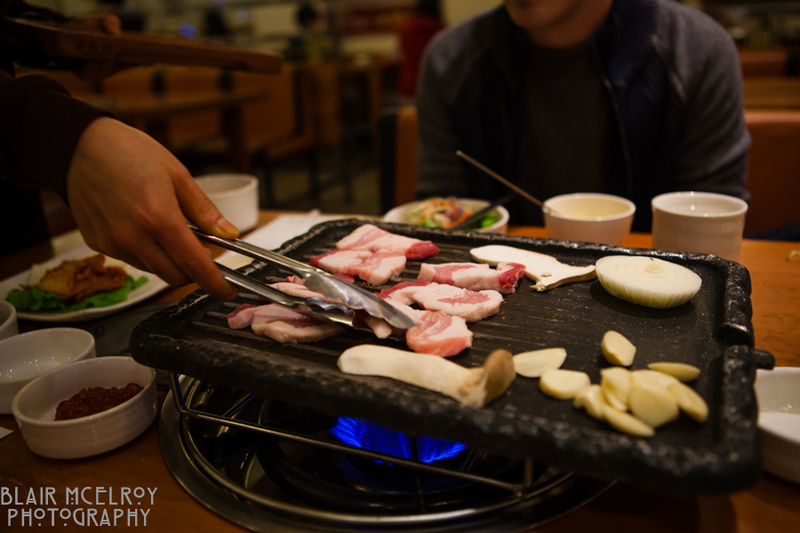 He said this isn’t bulgogi, but something much better. I dunno, I just ate. And ate. And ate. Returning, though, has been much more of a challenge. Every time when I return from a work trip, I have so very much to get caught up on. In this case I left for Chicago within the next week of returning, delaying the catching-up, thus leading to more stress and poor eating habits. Spring is also one of those times of year when sitting on the back porch with a beer is just so nice. So I’ve been doing some of that. I will start back strictly on paleo/primal next week (maybe even do a Whole30 challenge, I’m not sure). This weekend is probably one of the busiest weekends in my little town as we have our annual music and arts festival. Obviously there will be special food to be eaten and beer to be drunk. One last note, while I haven’t been cigarette-free since the end of December, I have gone without during the days and only smoke one or two when I have some drinks, and that has happened only a few times since December (more often lately – there is some serious stress in my life that I’ll not elaborate on just now). I realize this doesn’t mean I have quit officially, and I recognize the slippery slope I’m on. As I get my s#*t together, I’ll cut that back out again. Bear with me. Lastly, I made homemade deodorant! In my next post I’ll let you know if it is working.